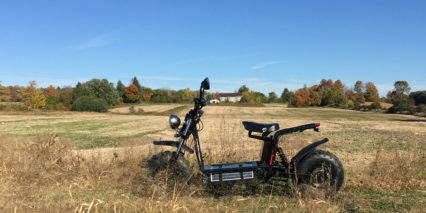 Daymak is a Canadian electric vehicle company based in Toronoto… They’re one of the larger brands with sales dating back to 2002 when they also sold gas powered scooters. 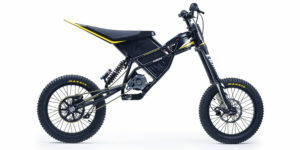 In 2009 they switched entirely to electric and the Beast is one of their most iconic products. 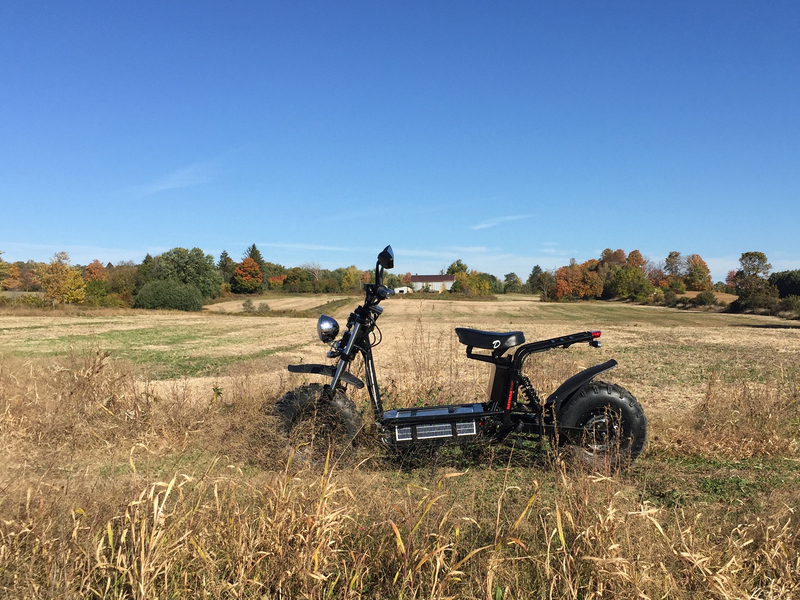 Unlike many of their other scooters and bikes which feel more generic, the Beast is one of a kind. There are three versions with the “Beast Standard” being the base level, most affordable option. 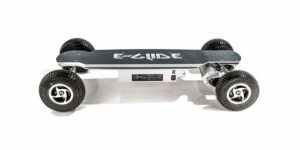 It comes with a basic sealed Lead acid (SLA) battery pack that won’t last through as many charge cycles before needing to be replaced and it won’t power you as far on each ride (or fast) but you save $1,000+ and still get much of the functionality that the Deluxe and Elite models offer. 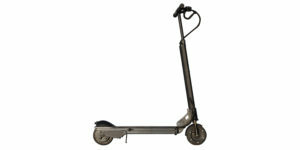 The Standard model will get you between 10 and 15 miles per charge and hit between 15 and 20 mph. 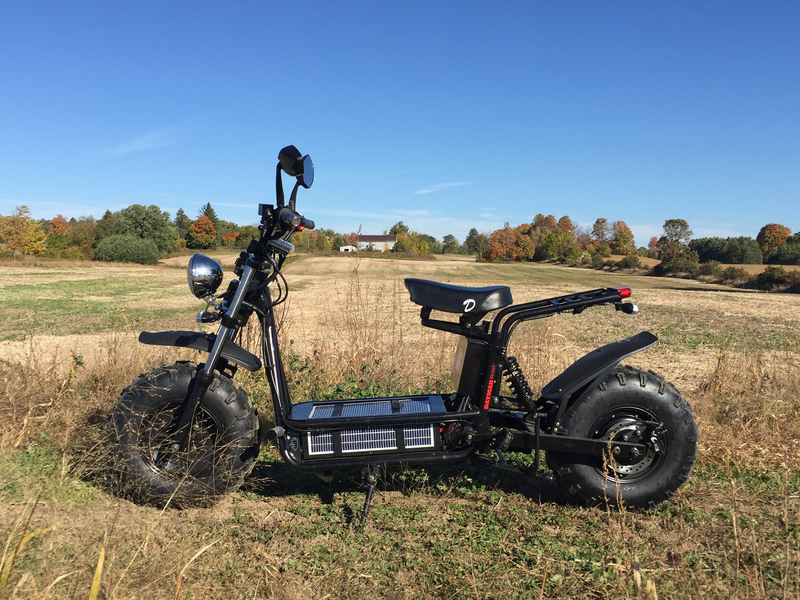 Technically, it’s classified as a low speed electric bicycle because it has pedals and is speed limited to ~20 mph with a motor that’s less than 750 watts. 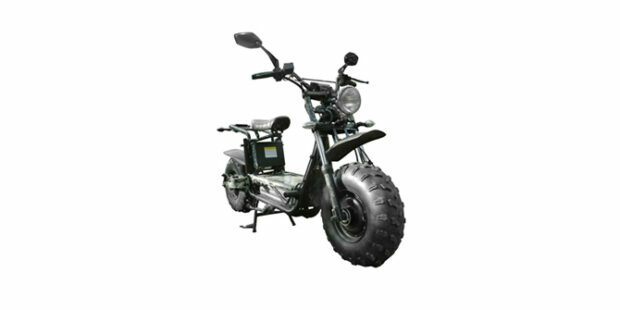 This means that in some countries (the US and Canada in particular) you do not need a license or insurance to ride it. 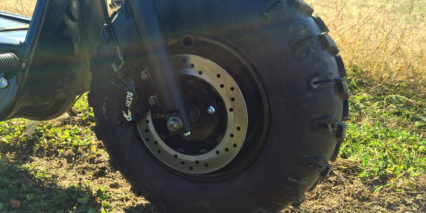 In practice, the Beast would be very difficult to actually pedal because it only has one gear, the crank shaft is directly below the seat instead of a bit forward and the extra wide and long saddle forces your legs to spread in an awkward way. 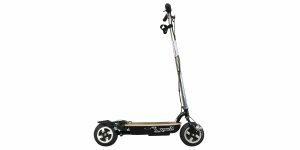 The most comfortable way to ride this thing is using the variable speed twist throttle for power and putting your legs forward on the deck or extended further out towards the pegs. 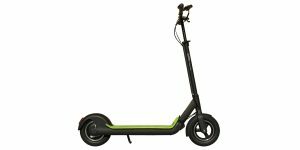 The pegs and adjustable height seat are a huge win for taller riders and not something I see on many electric scooters. 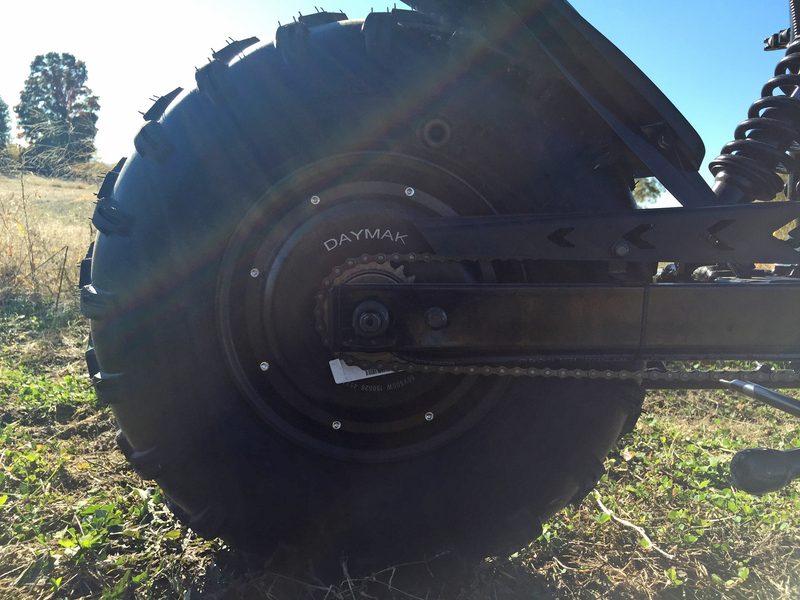 Driving the Beast is a 500 watt direct drive hub motor mounted in the rear wheel. This type of motor tends to be quiet and durable but also heavy and a bit weak at lower speeds. Given the smaller diameter wheels, the motor gets a mechanical advantage here and works fairly well… In the video review you can see a shot towards the end where I trade the bike over to Blain who weighs ~200 lbs verses my ~135 lbs and he starts off kind of slow. 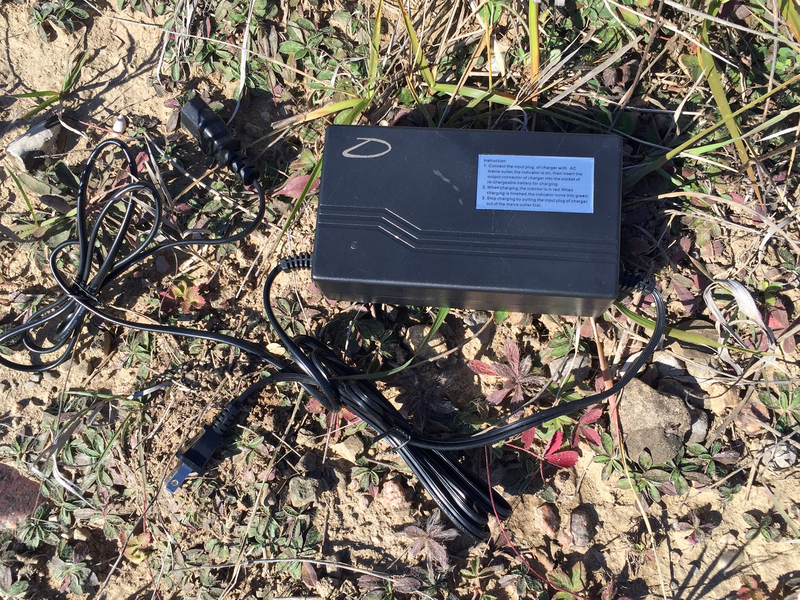 Granted, we were in a soft patch of bumpy dirt and scrub. 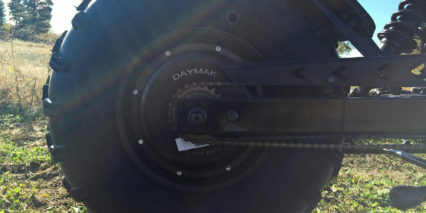 As mentioned earlier, Daymak sells two alternative versions with larger batteries for better range and a bit more power but the real upgrade comes with the “D” option. This D stands for “Double” motor and allows you to have a 500 watt motor in the front and rear wheel for an additional ~$1,300 cost. For heavier riders and those who want to climb steeper terrain this is definitely the way to go. 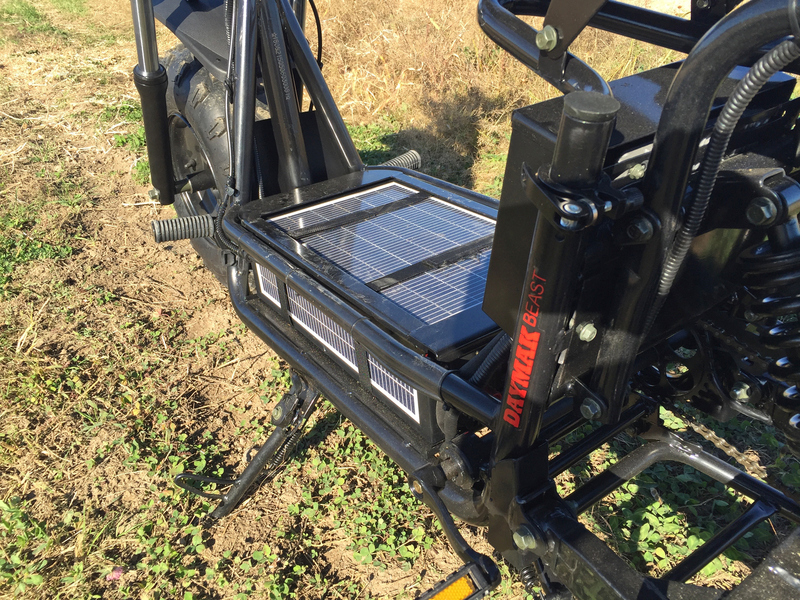 The deck on the Beast houses the large battery box which is covered by three solar panels. 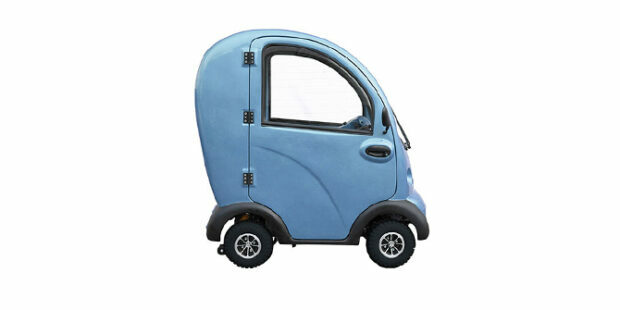 The panels are rated at 15 watts combined and could charge the bike (in ideal conditions) in around 40 hours. Keep the deck clean, park the bike in such a way that the bars and saddle won’t cast shadows and end up with a bit of extra juice at the end of each day! It sounds neat but in order to ride more than a mile or two after a day of charging you’ll still need to plug this thing in. Using any 110 wall outlet the Beast Standard charges to 100% from empty in about six hours. I love that the battery can be charged on or off the frame but it is quite heavy at ~62 lbs. 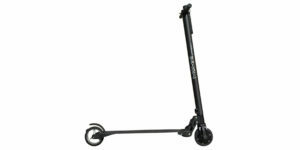 Thankfully, there are sturdy fold-out handles on both sides of the pack and straps across the top making it easier to hoist out of the frame. The other cool use for the battery is as a backup power supply. It has a built in three prong wall outlet (like we’re used to here in the US and Canada) as well as two USB outlets. 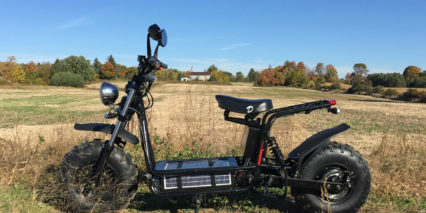 The battery is really the star of the show with this bike and can be quite impressive on the higher end Beast models which use longer lasting more energy dense Lithium-ion cells. 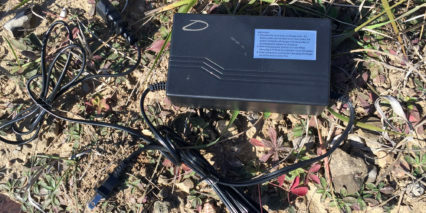 In all cases, the battery box is mounted low and center on the frame which improves balance. 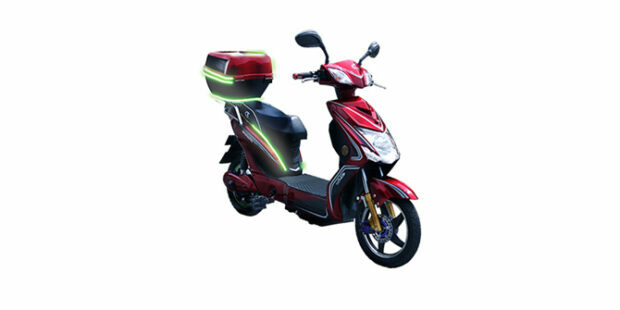 Operating the Beast is very easy, once the pack is charged and locked into the frame you insert the key into the ignition up near the display panel and turn it to “on”. 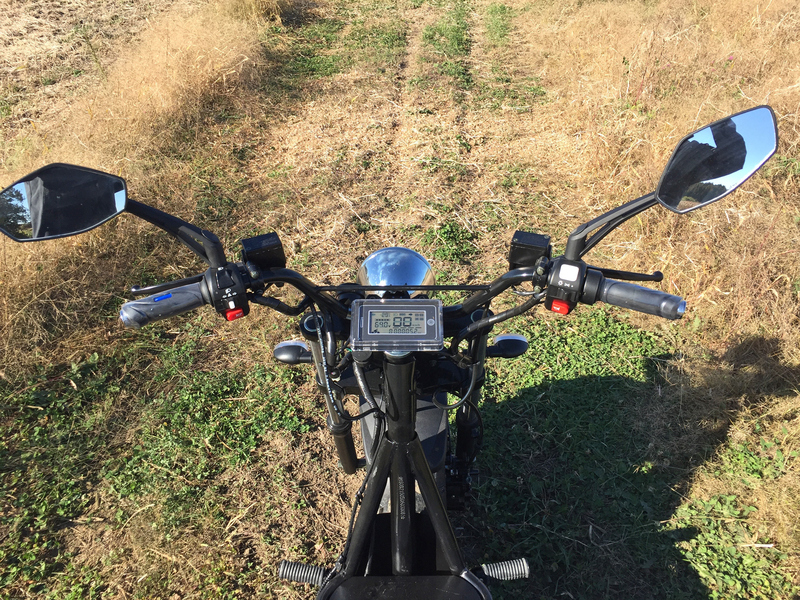 Just like a car or true motorcycle, the key must be left in while riding and as a result it can jingle around a bit but it’s never in the way of your pedaling or steering movements. 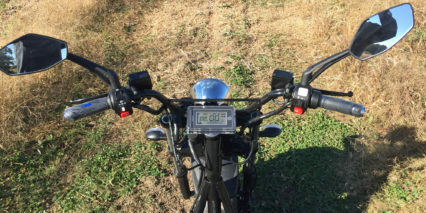 The display panel shows your battery charge state, speed, voltage use, odometer and several readouts about the lights, turn signals and brights. I like that they used a digital display here for more accuracy vs. some basic LED’s and I love that it’s backlit (with a soft blue hue). 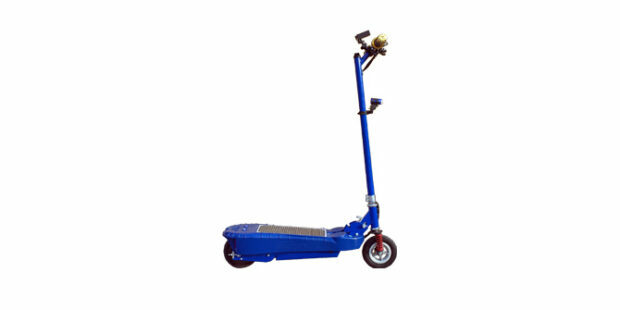 Given the bar-end mirrors, turn signals, front and rear lights and the horn, this scooter has everything you’d expect for riding safely in traffic. 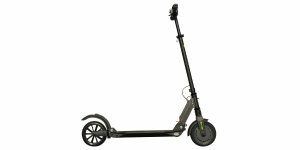 I could see myself riding it to work and back, especially given the higher speed options of the more expensive Beast Ultimate model. In that case, I’d be relying on my motorcycle license and insurance to operate legally on road. 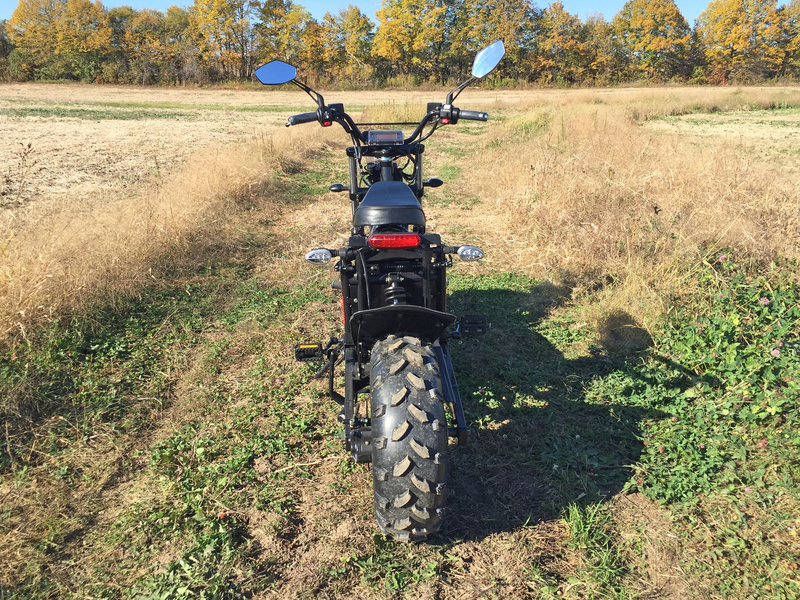 Even though the Beast Standard is the entry level model you still get full suspension, large protective fenders and an adjustable height padded seat. 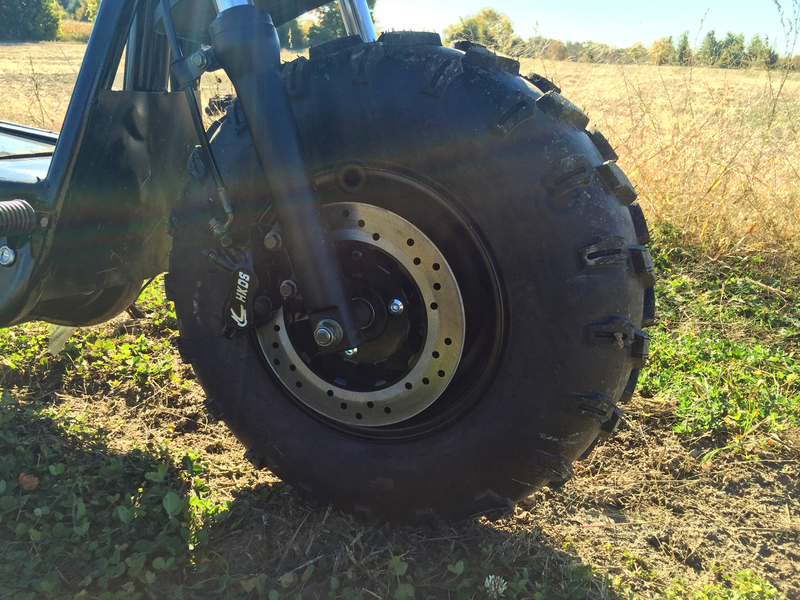 It feels great, even on very rough terrain and the oversized tires keep it very stable. while the headlight here is not LED as you’d get on the upgraded models, it still works fine. 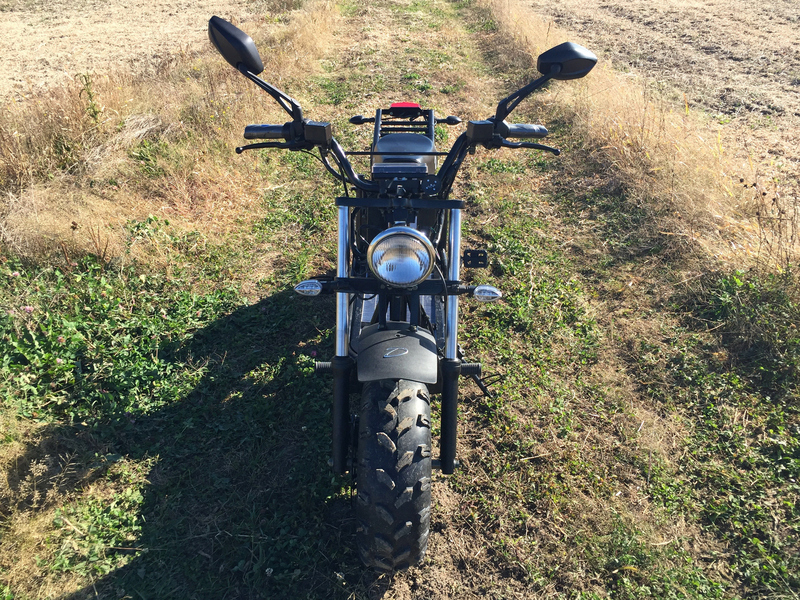 I took the bike on a variety of terrain types and it performed well (even in soft stuff) but there was more noise on concrete because of the oversized tread. 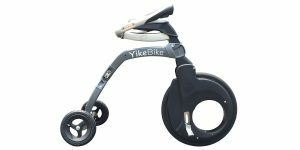 I like that you get two kickstand styles here for parking the Beast (the full double leg support for longer term, stable storage and a single-side quick kickstand). 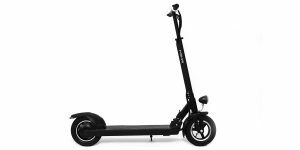 I did notice the single sided stand getting snagged while riding over some foliage a couple of times and this produced a bit of rattling but it never caused me to feel unstable. 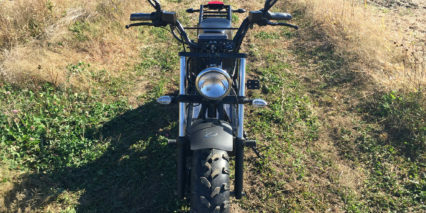 I believe the side stand can be removed if you’d like and there is also a kill-switch built in that keeps the bike from taking off if you accidentally twist the throttle while the kickstand is down. 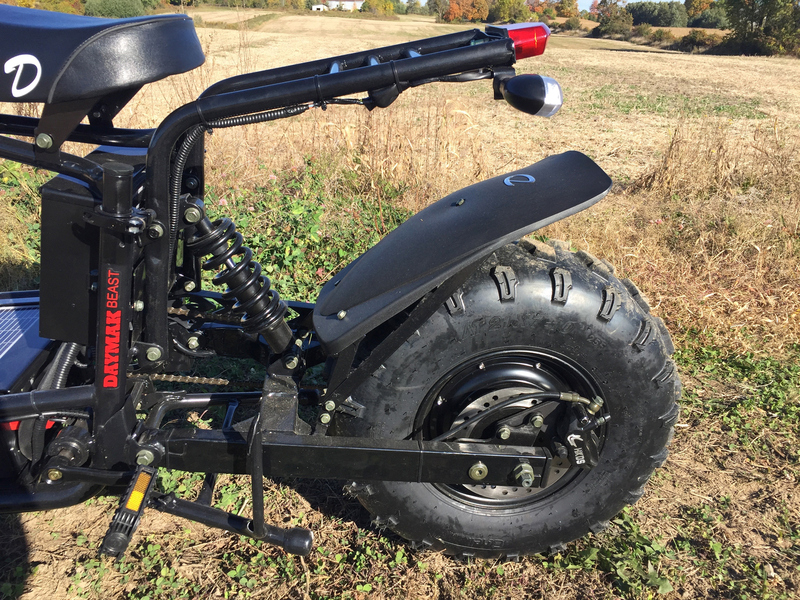 If you’re looking for a quiet, clean way to cruise around and have some fun, the Beast Standard is a neat toy but if you want to go further and have more power… check out the Deluxe or Ultimate. All models are 250+ lbs so make sure you’re strong enough to handle it. 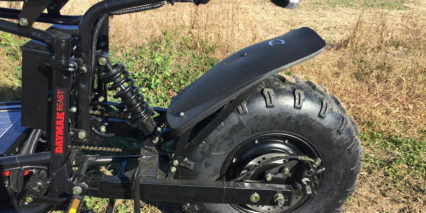 Note that the wider tires do make it easier to steer and balance but it could still tip and might not be ideal for smaller kids unless they are decent riders or have supervision at first. The rear rack mount is cool, you could use this with a box to haul stuff around a farm or get groceries in the neighborhood. My final thought here is on the subject of shipping. 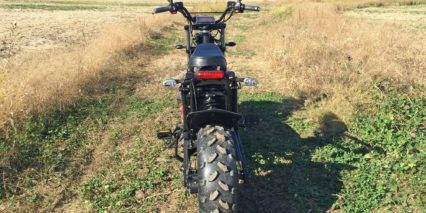 The Beast is large and heavy so expect to pay $300+, it’s worth checking their dealer network to see if you can find one in person but you’ll still need a truck to get it home. 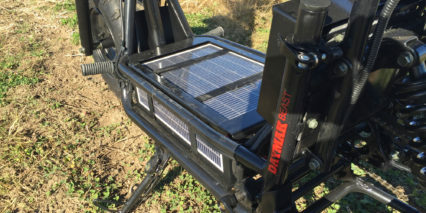 The Beast is inspiring with it’s solar charging feature and even if it’s not filling the tank each day you’re still supporting battery health through trickle charging. 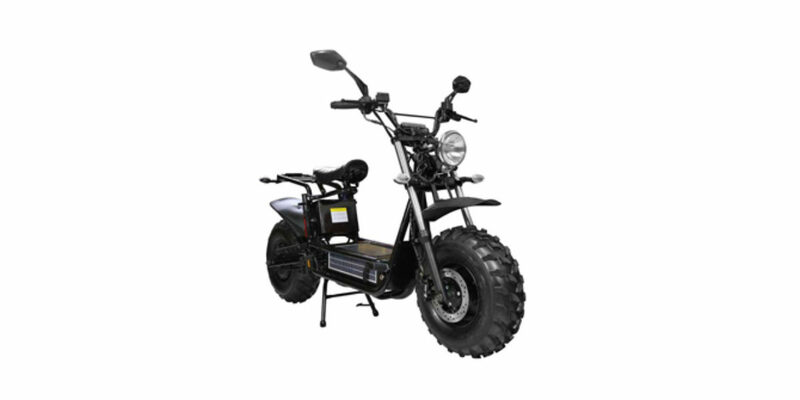 Hi how well do you think the beast standard would perform with a person who is 270 pounds thinking on buying cause of your review. In my experience, it wont go up any incline at all. It is a piece of junk and they wont stand behind it. 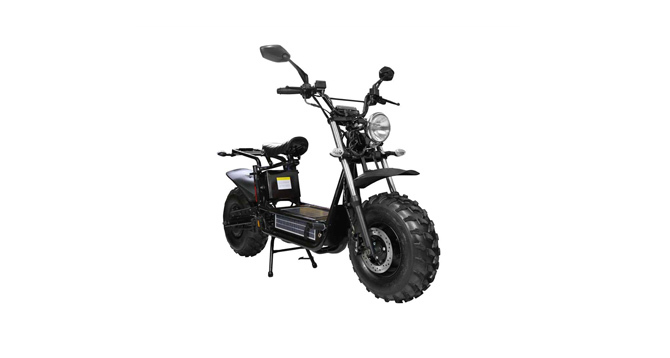 Beast D with lithium battery goes anywhere, fast and climbs hills. Even a standard Beast should go much better with Lithiums, lead acid is heavy and voltage sags too much. 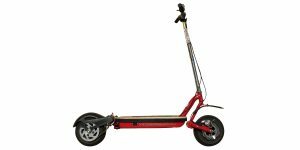 Lithium batteries are way better in our experience with Beast or any other ebike or scooter. This unit is way under powered for torque. It can’t climb any hills. I weigh in at 300lbs and I can’t do even a 5 degree incline. I also have the bigger batteries. This unit is not very good and the Daymak company is terrible to deal with. They do not honor their written warranty and have a lot of consumer complaints filed against them. I would recommend staying away from this unit and any other units this company makes. Thanks for the feedback Mark, sorry to hear that the bike hasn’t lived up to your hopes.